Welding is a cost-effective and flexible method of fabricating large structures, but drawbacks such as residual stress, distortion and buckling must be overcome in order to optimize structural performance. Minimization of welding distortion and buckling provides a systematic overview of the methods of minimizing distortion and buckling in welded structures. Following an introductory chapter, part one focuses on understanding welding stress and distortion, with chapters on such topics as computational welding mechanics, modelling the effect of phase transformations on welding stress and distortion and using computationally efficient reduced-solution methods to understand welding distortion. Part two covers different methods of minimizing welding distortion. Chapters discuss methods such as differential heating for minimizing distortion in welded stiffeners, dynamic thermal tensioning, reverse-side heating and ways of minimizing buckling such as weld cooling and hybrid laser arc welding. 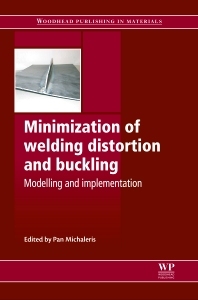 With its distinguished editor and international team of contributors, Minimization of welding distortion and buckling is an essential reference for all welders and engineers involved in fabrication of metal end-products, as well as those in industry and academia with a research interest in the area. Welders and engineers involved in fabrication of metal end-products, as well as those in industry and academia with a research interest in the area. Pan Michaleris is a Senior Software Architect at Autodesk Inc. He received his Ph.D. in 1994 in theoretical and applied mechanics at the University of Illinois at Urbana-Champaign, and was a senior research engineer at the Edison Welding Institute (EWI) until 1997. Pan served as a professor in the Mechanical and Nuclear Engineering Department at the Pennsylvania State University from 1997-2016. In 2012, Michaleris founded and served as both president and lead developer at Pan Computing LLC. Pan Computing was a software development and commercialization company for physics-based modeling of additive manufacturing processes. Pan Computing was acquired by Autodesk Inc. in 2016. His areas of interest include computational mechanics, finite element methods, manufacturing process modeling, and residual stress and distortion. Michaleris authored Minimization of Welding Distortion and Buckling and in addition to more than 80 peer reviewed journal and proceedings papers. He formerly served on the editorial board of Science and Technology in Welding and Joining, and was an associate editor for Welding Journal.